A layer of savory meat topped with mashed potatoes: when made with beef, it’s known as cottage pie, and when made with lamb, as shepherd’s pie. The French call it hachis parmentier, a hash named in honor of the man who brought France potatoes: Antoine-Auguste Parmentier. 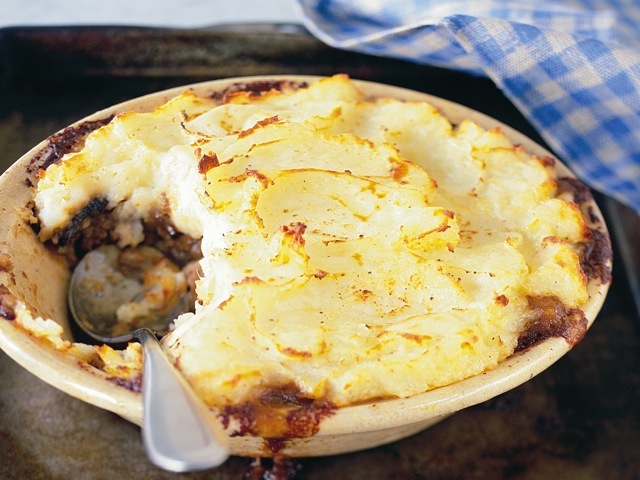 Because this is prepared with beef, it is technically a cottage pie. But because it is so full of mushrooms, it seems that the cottage must belong to a mushroom forager. Place the potatoes in a saucepan with salted water to cover. Bring to a boil, then reduce the heat to medium and cook until they are just tender, then drain. This can be done up to two days ahead of time. Place the porcini and shiitake mushrooms in a saucepan with the broth to cover. Bring to a boil, then reduce the heat and cook, uncovered, until the mushrooms are very rehydrated. Let boil for 5 to 10 minutes to reduce the volume of liquid and intensify the flavor. Add the garlic and nutmeg, and remove from the heat to cool. This can also be done up to two days ahead of time and kept in the refrigerator. In a heavy nonstick skillet, heat the olive oil over medium heat, then add the onion and beef and cook, stirring and breaking up the meat, until the onion is limp and the meat browned in spots. Mash up about 2 potatoes’ worth of potato and add it to the pan. Pour off the liquid from the mushrooms, then chop the rehydrated mushrooms and add them to the skillet with the meat sauce. Cook over high heat until the liquid has almost evaporated and the whole is savory and delicious. Remove from the heat and stir in first the soy sauce and then the sour cream. This can be done up to two days ahead of time and kept in the refrigerator. Preheat the oven to 400 degrees. Make a layer of the meat mixture in the bottom of a 9-inch pie or cake pan. (I like round, but an oval, square, or rectangle is fine, too.) Mash the remaining potatoes with 3 tablespoons of the butter and the milk. Spread on top of the meat mixture, and cut the remaining tablespoon of butter into bits, then poke the bits into the top of the potato layer. Bake for about 25 minutes, or until the top is golden in spots and lightly browned around the edges. Serve hot.